It’s just after 5.30am here. I’ve been woken up by three fire alarms this evening (the singular joy of a residence tutor) and I decided that it probably wasn’t worth trying to go back to bed now. It’s all light anyway. I’ve had my first coffee and, under normal circumstances, I would make something with a lot of butter in it now, to console myself over the lost sleep. But I’m all out of butter as I am attempting to wind down the contents of my fridge before I leave for the US on Monday night. So instead I’ll tell you about these summery strawberry cupcakes I made on the weekend for a friends birthday. I made them as a gift (cupcakes are good for gifts). I bought strawberries at the farmer’s market on Wednesday and some were beautiful – red and juicy – but others were still slightly under ripe and so I decided to turn them into these cupcakes. It is summer after all (even if it’s not actually warm and sunny), and strawberry eating is almost compulsory. 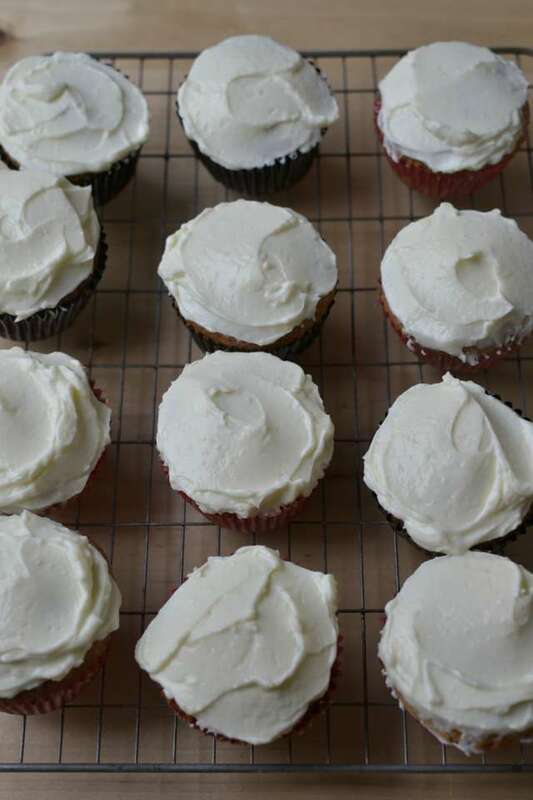 I topped the cupcakes with cream cheese icing, to add a slight tang to the sweetness. They were all eaten (except the ones I had left over which couldn’t fit into the box)! The recipe is adapted from one in The Primrose Bakery Book. Their recipe used raspberries and had a coconut buttercream but you know, I hate coconut and I didn’t have any raspberries so I used the basic recipe as a jumping off point. The result was a sweet, strawberry flavoured, slightly pink cake with bright white icing. I garnished them with fresh strawberries. My recipe made 18 cupcakes and not the said 12. I’m not sure if this is because my tray is smaller than normal or if I fill the trays less generously? Who knows. No one ever has any issues with extra cake as far as I know. Preheat the oven to 180C. Line a muffin tin with cupcake cases. Cream together the butter and sugar until whitened and fluffy. Add in the vanilla and then the eggs, one at a time. The mixture will split. Fear not. Mix together the flour, baking powder and cornflour. Fold into the butter mixture in two goes. Roughly chop the strawberries – I did this in a blender, just blending them lightly, you don’t want it totally puréed. Fold the strawberries into the mixture. Spoon into the cupcake cases and bake for about 15 minutes, until the cupcakes are risen and browned and spring back when touched. Allow to cool in the tin for 10 minutes before cooling completely on a wire rack. Ice with cream cheese icing once completely cold.